I know this fella drives some of you nuts..BUT he does explain the workings of music theory in the most thorough and complete fashion. Here we are looking at Primary triads, these are chords I, IV & V. So if you were in C major that would be C MAJO R, F MAJOR & G MAJOR. Take a look at the chart for further explanation.. These chords are very common in all types of music, including our three strands: Western Classical Tradition, World Music and Popular Music. They are the building blocks of The Blues Rock’n’roll and are still commonly used in pop music today. Note the use of ROMAN NUMERALS to identify chords. This system is used so that we can stop talking about “C, F and G” and discuss harmony without always relating to specific keys. 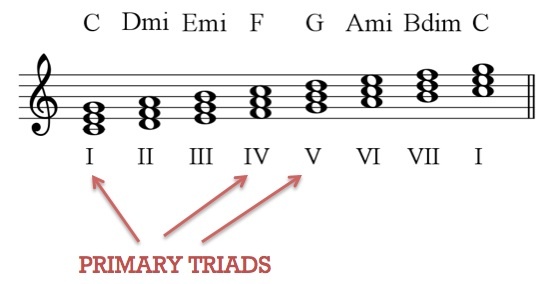 If this system is new to you, have a look at this for explanation of the Roman Numerals in music. This entry was posted in AoS2 Harmony and Tonality, Composer's Tool kit, Harmony & Tonality, Listening - Areas of Study on August 14, 2013 by simonballemusic. If you are unsure about cadences, a basic but informative video to help. Perfect, Plagal, Interrupted, Imperfect are the keywords. This entry was posted in AoS2 Harmony and Tonality, Listening - Areas of Study and tagged cadences, imperfect, interrupted, perfect cadences, plagal on September 6, 2012 by simonballemusic. Iiiinnn these videos – Intervals (not something in the middle of a show)……. This entry was posted in AoS2 Harmony and Tonality, Listening - Areas of Study and tagged harmony, intervals on September 1, 2012 by simonballemusic.